I think this screenshot represents what V5.0 is all about pretty well. Although your current development seems interesting to me, I can’t help getting the feeling that the avenue you’ve chosen merely complicates the model, while not really bringing any benefits towards organizing the information (at least from my point of view). In this setup we now have two organizational models, tags and fragment-links, that are starting to each do the exact same thing without really adding functionality to each other. Tags are still tags, without gaining functionality ‘as a tag’. And when you promote a tag to a fragment, it gets the functionality of a fragment, the functionality that we already had in fragments without them becoming tags. And I still fail to see the benefit of promoting a fragment to a tag instead of ‘tagging a fragment’, other then we can now document a tag (as a fragment) and mix our data into the tag-hierarchy. Moving parts of the data into the tag-hierarchy seems more of a problem then a benefit for me I commented on this before). Maybe you can do a blog-post about a real-life use-case for the new functionality, that would make things more clear about where you are going with this. Besides that, I really hope you will bring in some other functionality, like the possibility to tag the links between the fragments. This issue would be about the process of knowledge creation after all. You adopt a top-down approach while Piggydb enables both top-down and bottom-up but focuses on the latter. As I wrote before, when you manage a database whose structure is changing in the course of learning process, a tag set that only behaves as an index is not so valuable because the maintenance cost will increase as the database grows and finally it would be unmanageable. So I added another role to tags so that they can behave as important concepts/topics in a database. These concepts should be discovered in the course of growing a database and researched further by adding related information to them, and moreover, would inspire you to discover other concepts. They are not a mere index but central components of your knowledge. Still, a (somewhat complex) example use-case of how you perceive the use of this functionality, might go a long way in understanding what you want to achieve here. As far as I can see, and going from your replies, you expect something to ’emerge’ from this model, while not having (or at least making clear) a defined goal that could/should be achieved by implementing this functionality. Think about this please: just about any freeform database (tiddlywiki, tobu, even wordpress, etc.) are leaning heavily on tags for organization, and falling short for knowledge management and/or knowledge development, because of it. Yet the current front-runners in knowledge development and knowledge mining are applications like VUE (Virtual Understanding Environment), DeepaMehta, C-maps or even PersonalBrain that all focus primarily on creating AND exploring links between fragments/items. Just saying; some small enhancement to the linking feature (like being able to tag and/or name connections, this has been suggested before by others I believe), might go a lot further then your current focus on tags. PS. You keep referring to my data-model as being ‘top down’ but I can assure you it isn’t. Organization of my database grows and occurs as a result of all the interconnecting pieces of information. I think we have the same opinion about the risk of tagging, don’t we? I don’t intend to lean on tagging in the changes of V5.0-dev. It is the opposite. If you build your Piggydb database in a bottom-up approach, you don’t have to use tags at all as long as your database is small enough to be able to grasp the whole picture. You just input fragments and connect them as needed. When your database grows so large that you are beginning to lose the grasp of the whole picture, you might want to make some fragments stand out by turning them into tag-fragments. Tag-fragments are capable of having and displaying wider variety of fragments than normal fragments, and a tag set provides you with the image of what your database is all about. Because of these, I even thought about removing the tags input from the fragment form in V5.0-dev aiming at discouraging users to create tags easily. Anyway, I’m going to continue to work on changing the core model in V5.1, it’s not finished yet. In V5.1, I’m going to update the spec on the fragment relationships (aka. fragment-links). So it might be too early to judge. >Tag-fragments are capable of having and displaying wider variety of fragments than normal fragments, and a tag set provides you with the image of what your database is all about. The problem with looking at a tag is that it groups fragments (under the tag) without showing the link-relations between those fragments. At least not yet in the current dev-release. So that’s probably why I don’t see the advantage (yet). >Anyway, I’m going to continue to work on changing the core model in V5.1, it’s not finished yet. In V5.1, I’m going to update the spec on the fragment relationships (aka. fragment-links). So it might be too early to judge. What do you exactly mean by “without showing the link-relations between those fragments.”? 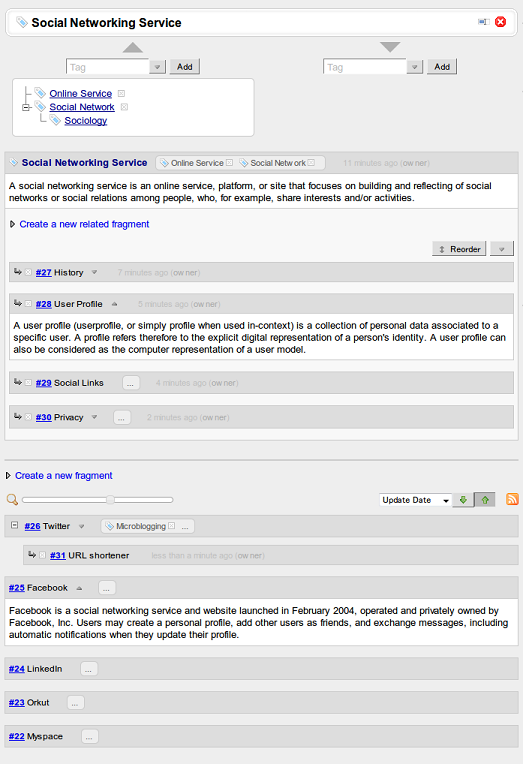 The link-relations are shown in the list grouped by a tag as expandable nodes or table rows that contain the parents or children.